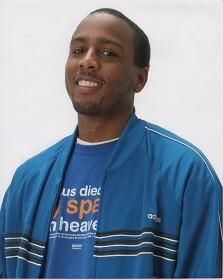 In 2007, Ishan Hines’ younger brother, Atif Hines, died by suicide. Ishan describes his brother as a dedicated father and hard worker. He believes his brother struggled with depression for years but did not seek help. Afif’s death came as a shock to everyone in his community because he always “appeared” upbeat and stress-free. Ishan, now known as Purpose, has begun sharing his brother’s story and educating youth on the risks and warning signs of suicide. Q: Why did you change your name to Purpose? A: Living with purpose instead of dying for nothing is the main reason for the change. I believe that God has a purpose for everyone. I feel that my purpose is to help those who may be experiencing emotional, mental, physical difficulties, and to share my brother’s story all over the world to educate the youth about suicide. Q: What are your personal views on suicide? A: I can understand why people commit suicide. I feel that it is a bad decision that affects everyone and I also think that it is a selfish act. However again, I can understand why people can feel like giving up on life. I believe that pain can cause a person to think irrationally and have suicidal ideation, especially if that person does not have a good support system or is receiving any treatment. Q: How has this experience change your view about your own life? A: Suicide became an option where as, it had never had been before, in my own life. My life is still very stressful, with raising my brother’s daughter, helping family cope with the death of my younger brother. I had to seek mental health counseling for myself which I received from my home church located in Philadelphia. At times, it is still very hard for me to continue living on without my brother. This experience also has opened my eyes to see how important mental health counselors are. Prior to the death of my brother, I felt that “shrinks” were for crazy people. Now I understand that they are not just for crazy people but for all people. Q: How have you maintained yourself emotionally and mentally? A: Mentally, I continue going to church and journaling my thoughts. I also write music, and read the Bible on a daily basis. Emotionally, I am still damaged; I have begun the grieving process, but I have not yet accepted the death of my brother. I think that if he had just died naturally, it would not be so hard on me. But because he died by suicide, it’s just really hard to accept. I still desire to see him, hang out with him and talk with him. So emotionally, I am on my way, but I still have ways to go. Q: Do you think there is stigma attached to suicide that prevents minorities from seeking mental health service? A: Yes. I think that because African Americans are usually faith-based people, suicide is rarely an option. I say that because African American folks rely heavily on religion; we believe that God can solve any problem. But the misperception is that suicide only affects whites. In my opinion, I don’t feel that color is the issue, but it helps me realize how people deal with pain. It gave me compassion about how people are all different and how they process things differently. I don’t think the color of your skin determines a person at greater risk for suicide. However, unresolved pain and depression does determine who will commit suicide. Some say that there is no greater love than that which exists between a parent and child. When a parent loses a child to suicide, grief may be all encompassing. Fortunately, there is hope. Are you a parent? Even if you’re not, you likely understand how much love a parent holds for a child. They nurture their children, support and encourage their needs, and even indulge them in their desires. Parents watch their children grow and hope that they become happy, healthy, and successful adults. Unfortunately, life sometimes takes a devastating turn that can result in the loss of a child. When this happens, parents may turn to unhealthy practices in order to find relief. Fortunately, there are ways to help a bereaved parent cope with their loss. Feelings of anger or bitterness. The grief response seems too intense to handle. Despite these factors, there is hope for parents who have lost a child to suicide. Continue to reach out: While bereaved parents get an initial outpouring of support, there comes a time when people will stop offering condolences. When this happens, the parent may feel extreme isolation. As such, it is important that you continue to reach out and offer support even after things seemed to have settled down. While others have moved on, it may take years for the parent to find peace. Remember to be patient and non-judgmental as the parent moves through the process at his or her own pace. Connect with community resources: Often, communities offer support groups for individuals who have gone through similar tragedies, such as death of a loved one by suicide. Whether religiously affiliated or not, these groups can be a great resource to help parents cope with the loss of a child. Just knowing that they are not alone in their struggle can be a great comfort to a grieving parent. Seek help: Parents who have lost a child can benefit greatly from speaking with a medical or mental health professional, including a grief counselor or a social worker. These individuals are trained to deal with even the most difficult situations. Provide information: When a parent is bereaved, he or she is likely not thinking clearly. By providing your loved one with information on coping skills, suicide, mental health, and the dangers of substance abuse, you are helping them recover. Be sure not to force this information upon them, however, it may be enough just to leave a resource book or pamphlet in their home. While there may be no greater tragedy than the loss of a child, there is hope for parents who continue to suffer. For more information and resources, please feel free to contact us today. Steve Johnson co-created PublicHealthLibrary.org with a fellow pre-med student. The availability of accurate health facts, advice, and general answers is something Steve wants for all people, not just those in the health and medical field. He continues to spread trustworthy information and resources through the website, but also enjoys tennis and adding to his record collection in his spare time.